Over the past 10 years, Hollywood and Democrats have flirted and talked of how America should strive to be more like Marxist and Socialist nations like Cuba and Venezuela. Producers like Michael Moore, who embraced ruthless dictators in his desire to transform America into a third-world nation! However, within a few short years, the Venezuela nation has stripped its people of power, money, and even the ability to provide food and shelter for their own families. Sadly, it is an all-too-common scene in Marxist based nations! Now, as of tonight, the people of Venezuela have hit the breaking point, as the nation now burns, and the people are fighting for their right to even exist! In fact, the Venezuelans have hit the streets and are protesting the corruption and brutality of the Maduro regime, and his Marxist ideology, which has destroyed the nation! It began with the Marxist regime stripping rights from the people, murdering or exiling political opponents and dissidents, and bankrupting one of the most oil-rich nations in the world. Still, the Marxist leader Maduro has sat on his throne, living the life of luxury, while helping to make each and every Venezuelan citizen equal. They are equally poor, equally starving, equally homeless, and equally desperate, as it led the people to hate the Marxist leader and his political ideology! It makes it hard to believe that Venezuela was recently considered one of the most wealthy nations in South America. The downfall began in 1999 when Hugo Chavez took power and quickly had opposition leaders and dissidents exiled. He implemented his promised Socialism, which he said would bring great prosperity to the nation, but instead, it only brought extreme poverty and despair. More recently, Nicolas Maduro took over the Marxist regime, and his leadership has further seen the nation slide into even greater impoverishment and desperation, as the people had begun to lose all hope. The government later said the rogue officers took two vehicles from a police station in the western Macarao district before driving across the city to a barracks in the eastern Petare slum, where they stole an arms cache and kidnapped four officials. The group were reportedly only low-ranking officers but their actions suggest there is discontent within the armed forces. His contacts in Venezuela also reported the conditions, as they warned America about the false promises of Progressivism (Socialism) and Marxism…. El socialismo falló a los pobres y enriqueció a los poderosos. Socialism failed the poor and enriched the powerful. Sin libertad de ideas, la violencia se convierte en el lenguaje de las personas. With no freedom of ideas, violence becomes the language of the people. I say goodbye because I do not know if tomorrow communication will be so fluid. There are many sectors at this time without electric power and the first 16-year-old named Alixon Pizani died in Catia due to firearms in the protests. God is with me, nothing will be missing and I promise to take care of myself. Tomorrow will be an important day for my country. Today, the riots are only continuing to grow, as the people of Venezuela are without food, water, electricity, and many times even shelter. In fact, reports of at least low-ranking military, police, and other governmental groups are reportedly having their work-force joining in with the protesters as discontent has hit a boiling point. 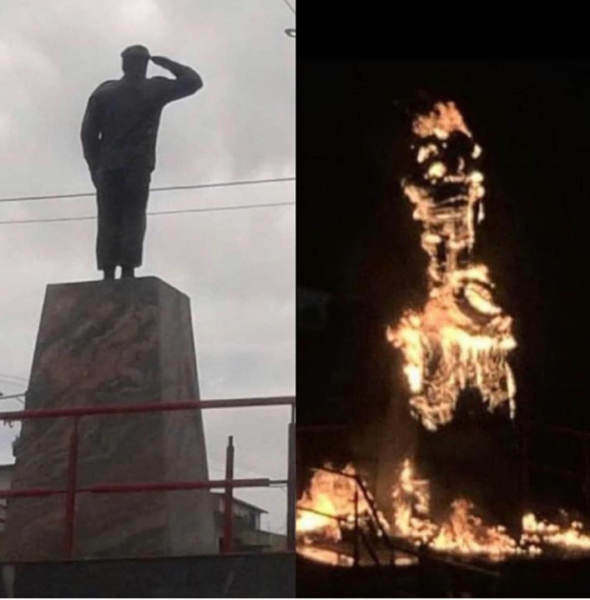 Regardless, the protesters and rioters have lit the famous statue of Chavez on fire, as well as they are burning down much of the city in their attempt to overthrow the brutal Marxist Dictator! Unfortunately, this is where the United States is headed under the leadership of Nancy Pelosi, Chuck Schumer, and the rest of the Democrat Party. After all, the policies of Alexandria Ocasio-Cortez (D-NY), Castro (D-TX), and numerous other Democrats who want Socialism to be implemented here are the same policies of Chavez and Maduro in Venezuela! Therefore, not only should you pray for Venezuela tonight, but pray for America, as we must never allow our nation to continue heading down the Marxist path of the New Democrat Party of today! Next Next post: DEMS EMBRACE MARXISM: Democrats Hand Rep. Ocasio-Cortez (D-NY) House Finance Committee Position, As She Declares ‘ALLOWING AMERICANS TO KEEP THEIR MONEY AND MAKE BILLIONS IS IMMORAL’!